Huge Savings Item! Save 16% on the mophie juice pack H2PRO - Waterproof Mobile Protective Battery Pack Case for iPhone 6/6s - White by mophie at Got Busted Mobile. MPN: 3105_JPPRO-IP6-WHT. Hurry! Limited time offer. Offer valid only while supplies last. Are you looking for a premium iPhone protective case? Look no further because the mophie juice pack H2PRO can answer all of your protection needs. Are you looking for a premium iPhone protective case? Look no further because the mophie juice pack H2PRO can answer all of your protection needs. Its dual-injected rubberized exterior ensures all ports are water tight. In addition, the screen protection keeps your phone safe from drops, dust, and water. With an impressive rating of IP68 by the IEC, our juice pack securely preserves your iPhone 6 and 6s. IP68 means we provide a high degree of protection against dust particles and water. You can immerse your iPhone under water up to 1.2 m, and it will still work fine! What's more, the H2PRO is compatible with Touch ID. You can still fully use your phone's touch screen. Compared to our competitors, we provide the best possible combination of water resistance and touchscreen performance. In addition, our juice pack comes in a pocket-friendly design. Measuring only 0.69 inches in depth, you can insert your phone in your pants pocket comfortably. Lightweight yet durable, your phone will remain safe even if dropped from 1.2 m.
Waterproof your iPhone 6 and 6s with the mophie juice pack H2PRO! SECURE WATERPROOF PROTECTION - Do you enjoy having music in your bathroom or perhaps browsing Facebook while soaking in the bathtub? All of those are possible to do thanks to the H2PRO from mophie. You don't have to worry about water seeping into your phone, and ruining the sensitive electronics within. The juice pack is safe water resistant and is safe even if immersed under water up to 1.2 m for up to 30 minutes. 100% EXTRA BATTERY - When you're on the go there's a slim chance you'll find a charging port. With the mophie juice pack H2Pro, you don't have to worry anymore. Its powerful rechargeable 2,750mAh lithium-ion polymer battery delivers 100% extra battery life. You get 28 additional talk hours, can browse the Internet for up to 20 more hours, and stream video for up to 22 additional hours. SCRATCH RESISTANT AND DUST PROOF - The H2PRO features IP68 Ingress Protection. This means that it has been tested and passed standards against the invasion of dust, foreign objects, and water immersion up to 1.2 meters for 30 minutes. The scratch resistant membrane for the touch screen allows for clear views, and is anti-glare. LIGHT AND THIN DESIGN - Protective cases nowadays come in all shapes and sizes. Unfortunately, some cases are too bulky and hard to handle. The H2PRO is only 0.69 inches in depth. While it packs a slim design, it still exceeds military tests for protection against drops up to 1.2 meters. FULL ACCESS ON PHONE TOUCH SCREEN - Many people worry that using a juice pack may affect touch screen's response badly. Mophie's juice pack H2PRO is different! We assure you that our juice pack provides the best combination of touchscreen performance, water resistance, and protection against damage. In addition, the protective case is compatible with Touch ID. You can still fully use your iPhone's touch screen. 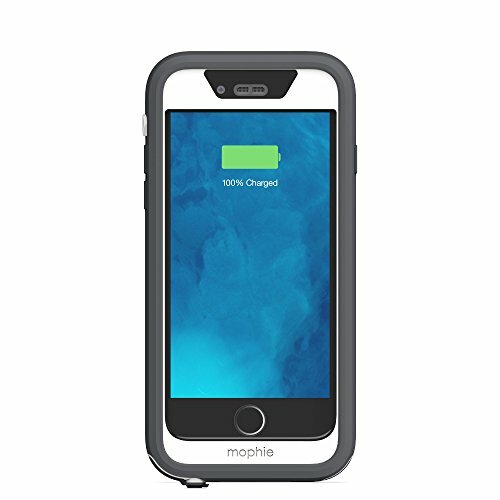 If you have any questions about this product by mophie, contact us by completing and submitting the form below. If you are looking for a specif part number, please include it with your message.